Need advice about a specific Honda Civic problem? Chart based on 170 repairs. 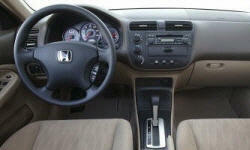 See TSBs and recalls for the 2005 Honda Civic. Chart based on 148 repair trips. The repair cost chart excludes repairs made under warranty, do-it-yourself repairs, and repair trips that include maintenance. See repairs for all Honda Civic model years. 58900 mi One problem that was left unrepaired was the gas tank release broke. Down by the drivers seat on the floor. Told this problem can be common, but was about $250-300 to repair. Made due by opening the gas tank via a release in the trunk wall. 139000 mi Shifter was hard to shift, was a problem with the shift gate. Car was difficult to drive if one did not know what to do. 103000 mi Battery went out at 102K miles. Dealer cost was ~$2,000. Beware of this issue on high mileage hybrids, costly repair if you're responsible. Used battery alone is $1500-1800, new it's >$3000. US $3000 BUYER BEWARE!! Replaced IMA battery 2X ($4,000) in less than 6 months. Computer went out at 110,000 miles also-- another several hundred dollars. In the end, repairs (>$5,000) were no longer worth ownership. BUYER BEWARE! US $85 Engine would fail to start. Battery wad tested and wad just at the replacement indicator, so I replaced it. US $2500 Engine blew a head gasket. 53000 mi Hybrid battery replaced in September 2012 prior to my purchasing the vehicle. US $18900 Four shocks, tie rod & alignment. 118563 mi Bad bracket w/corrosion on top of battery. Part not available at the time. Part cleaned as a temporary fix. Bad oxygen sensor. Part not available. Must be ordered. Had neither time or money for this repair. US $1046 Two weeks after the front oxygen sensor was replaced, check engine light came on again. The two rear oxygen sensors had failed. US $215 Serpentine belt fraying. Replaced same. C $20 Fuel door release latch mechanism failed. Made replacement part and fixed it myself. US $1200 The head gasket failed on the exhaust side, coolant would blow through the exhaust, not stranding me but requiring I add coolant daily. Common fault for Honda engines of this year, Subaru used the same Head gasket vendor. US $300 Radiator as starting to rot around the tanks, allowing some seepage from coolant, never left me stranded, but needed a replacement radiator. US $2300 Engine block cracked. US $900 Water pump failed. US $250 Left coil and strut failed. Replaced both front coil/strut assemblies. US $100 Engine overheats on trips over 4 hours. Took car in for diagnosis, mechanic reports head gasket leak, $1300 repair. Decided against it as the cost is too expensive against civi's current value. US $40 slow coolant leak, overheating on trips longer than 3 hours. shop said it was a head gasket leak. I decided to use Bar¹s Leak HG-1 first before a roughly $1200 gasket replacement. Seems to have worked, but I've yet to take a long trip in it. 148000 mi Airbag light was on. Sensor in the driver's side buckle was replaced under warranty. US $275 Sticking front caliper. Caliper, pads replaced. 102000 mi Hole in the condenser. US $116 Had to replace front lower motor mount in order to pass state inspection. US $370 Lower control arm bushing boot broken, leaking fluid. Replaced both sides and performed alignment. Lower control arm bushing boot broken, leaking fluid. Replaced both sides and performed alignment. C $50 Diagnosis of clutch pedal noise and rough feel. Mechanic said throw out bearing needs replacement. Recommended wait until clutch replacement to address. Diagnosis of clutch pedal noise and rough feel. Mechanic said throw out bearing needs replacement. Recommended wait until clutch replacement to address. C $100 Door lock actuator failed for drivers side door a I replaced it which fixed the problem. C $200 Alternator went. Replaced alternator ourselves. C $500 Wheel bearing replaced. 65000 mi Lower control arm bushings replaced (entire LCA assembly - both). Clunking noise from weak bushings. Poor quality OEM parts. Wiring harness to trunk lid, ground wire separated at crimp joint. All lights on trunk out. incorrectly routed OEM wiring harness. Poor build quality. Lower control arm bushings replaced (entire LCA assembly - both). Clunking noise from weak bushings. Poor quality OEM parts. Wiring harness to trunk lid, ground wire separated at crimp joint. All lights on trunk out. incorrectly routed OEM wiring harness. Poor build quality. I guess Honda 'aint what it used to be. US $117 When making hard turns rear brakes make grinding noise. Honda dealership mechanic found rust on brakes/rotors. Performed front and rear brake maintenance. Noise problem fixed. US $100 Car wouldn't start, though it tried. Finally got it to start (after 3 days of trying periodically). Mechanics think it is a starter problem, but couldn't reproduce it. $200 Thermostat and engine coolant got replaced, engine overheat hasn't been seen so far. $900 Engine head gasket failure, it had to be replaced. Engine head was also repaired. Coolant was refilled. Engine gasket was the cause of engine overheating and as a result of that, engine head was also damaged. US $270 Alternator was seized and belt tensioning hardware was very rusty. Replaced alternator and belts. Cleaned or replaced hardware as needed. OBD 2 open oxygen sensor heater code, replaced upstream oxygen sensor Hood latch was stuck. Release cable moved freely so the latch was removed from the radiator support, cleaned/lubricated, and replaced. US $309 Engine died with P0340 code, inspection confirmed the Camshaft Position Sensor was failing. Sensor replaced, other routine maintenance accomplished. C $350 Rear oxygen sensor died, replaced with non-oem part to save on over half the cost (unknown part make/model to me). The part ended up being ok in the long run, but the car behaved oddly at first (computer re-adjusting maybe?). C $800 Water pump seized, needed to be replaced, timing belt shredded. US $400 Both front wheel bearings failed almost simultaneously and required replacement. US $232 Roaring noise lead to failed wheel bearing hub. Also discovered rear wheel cylinders failing and leaking, so they were replaced along with new brake shoes. Drums were not damaged, so reused. C $45 Windshield washer pump replaced. C $200 Trunk release cable stopped working and trunk lock not working. Both items replaced. C $531 Replace oil pan, gasket and filter. Oil pan coroded and leaking around gasket. C $400 Alternator gone, had to replace. C $600 AC stopped working Replaced condenser,AC sealer, evacuated and recharged system. 52500 mi Factory alarm self arming and locking without warning. TSB suggested replacing alarm module and reprogramming remotes. Cost to be assumed by customer as there is no formal recall of the unit. Chose not to have system repaired due to cost. 96000 mi bearing failure in final drive of transmission. Will cost over $2600 to repair because it require a total rebuild of the transmission. Not decided whether to repair or get rid of this car. Front wheel bearings were making noise. US $1600 Throttle body sensor became out of whack. Honda did not sell just the sensor, so the whole throttle body was replaced. US $897 The valves were having issues causing engine to run rough. Once the valve adjustments was done, it runs great again. The power door locks on the driver side of vehicle no longer work and I was not paying $750 to fix them. US $1800 Cracked exhaust header. Since it is conntected to the catalytic converter, it all had to be replaced. US $1600 Head gasket shot. 106640 mi Power steering column leaking fluid. Due to rusty brake lines surrounding the power steering column, there was a high probability of needing to replace the brake lines. Since the estimate for this was large (~$1000 - $2000), and this car needs a new battery and brakes too, I chose not to repair this and plan to retire the vehicle. US $35 Actuator on the rear driver side which didnt lock my doors. Easy fix, finally got to repairing it Common problem with this car is that the rear center lights go out! Had it fixed for 35$. Seems like everyone who has this model has this problem. C $195 Air bag light on. Sensor in seatbelt defective. 198600 mi Car was making loud noise when in gear, took it in for inspection. Found metal shavings in transmission fluid and determined full transmission replacement would be necessary. US $850 Old clutch was shot; replaced with new and added light flywheel. Update: it was a mechanical failure of the disk proper, due to improper reinstallation of the trans on the motor (one of two alignment pins was lost and not reinstalled.) Replaced 2x axles. Old ones had gone too long without maintenance and were shot. Replaced 2x tie rod ends. Boots were shot. Replace 2x ball joints. Replace lower control arm bushes. This crap was old and tired. Needs end links too, but I'm blowing that off for now. US $20 Poor heat on cool mornings drove me to flush and fill the radiator using typical off-the-shelf chemicals. During that effort I discovered that the overflow bottle had contacted the serpentine belt system and had a hole worn in it. This caused the car to lose enough fluid that the heating performance suffered. I took it out, patched it with fiberglass mesh and adhesive, reinstalled, finished the flush-and-fill, and thereby solved the problem. Flush-and-fill probably not necessary. US $300 Old radiator (assumed to be factory original) split at the top tank while driving. Pretty exciting. Installed new radiator, upper and lower hoses, new (green) coolant. 97100 mi OEM Spark plug cracked and fell into the cylinder and caused internal damage. Honda USA denied any responsibility, 3rd party warranty denied claim, dealer reassembled the engine at no-charge to customer (me). US $1500 Ac compressor seized. Replaced associated parts. US $200 Door actuator failed. As a result, the remove lock/unlock stopped working on the driver side door. I replaced this part. Radiator cooling fan motor failed (motor would not engage). Replaced this fan and everything is now working fine. Window regulator failed (cable snapped), leaving the window inoperable. Honda wanted $550 to replace the part. They charged me $100 for diagnosis and I fixed it myself ($200 for OEM part and 2 hrs to install). C $800 seatbelt sensors. took over 1 year and repeated trips to the dealer for them to figure out they needed to replace the seatbelts. in addition to this cost i had several hookups to diagnostics and replaced a sensor unecessarily add'l cost$900. US $350 Radiator cracked at plastic part of tank. Replaced radiator. 52080 mi Front right and back left motor mount worn. US $1100 Engine overheated once, ran hot, and had limited heat in car at low rpm. Radiator overflow reservoir overflowed. Head Gasket, Thermostat replaced, head bolts, seals and misc gaskets. Head cleaned & resurfaced. US $500 Alternator was replaced. Head Gasket was replaced due to coolant leak. US $168 Engine was overheating. Shop replaced thermostat. US $996 Honda shop: corrosion caused by faulty Honda coolant. Service bulletin did not fix problem. Car needed head gasket, also engine due to extreme corrosion to head. Honda offered new $10,000 engine for $5,000. We'll replace engine elsewhere. The used car dealer who sold us the car subsidized the replacement of the Civic engine with a salvage engine. He paid $700; we paid $996. The car runs and functions very well now. US $398 Heard growling noise. Mechanic replaced bearing set on front right wheel. Aligned wheels. US $819 Oil leak. Replaced front crankshaft seal. Replaced camshaft seal. Replaced timing belt and water pump since we had engine apart. US $81 Front wheels difficult to align. Mechanic "slotted both front struts for camber." Cost $81. Replaced rear muffler. $300 parts and labor. US $300 A flaw/failure in the cruise control servo was somehow causing the shifter lockout solenoid to chatter wildly (?!!). Unplugging the servo stopped the problem. $300 to diagnose. Did not repair for the additional $300 as we very seldom use it. US $14 Lower ball joint boots replaced. 138000 mi Adjusted valve clearances, as valvetrain was becoming noisy. 45000 mi Problem with manual transmission. Repairs would require complete disassembly and at least $1K. US $3500 The car hasn't been fixed yet. There were spun bearings and the car won't work. We don't have the $3500 for a new engine, which is what it will require. US $1000 Replaced the engine ourselves with a used engine. 109000 mi Cars clutch went to the floor and car died. The clutch lining was worn out. The slave cylinder went out. The transmission needed to be rebuilt, it leaked oil. Unrepairable, the car was junked. A/C was out. US $200 The boots needed to be replaced. Once done, now there is a flapping sound every time I step on the brakes. US $80 Battery failed while my wife was driving the car, stranding her. I came out and cleaned battery terminals - no improvement, then replaced battery and everything was fine. I tested the old (original) battery and confirmed it had a partial short. 159000 mi I had an oil leak at 140000 miles in 2012. Oil leaked out from under the timing belt cover and ate up the the timing belt, this repair however was after years of racing and abuse. Driving over curbs hitting the bottom of the engine. 170000 mi Oil leak because I changed my oil at the honda dealer and they put way too much oil in the engine. I also drive really fast which turns the oil pump faster and wears seals out faster. As well as creates more heat. 192000 mi alternator needed replaced. because i ran it with a dead battery and my lights and radio on. it has really been a great car. €150 ABS light on, software problem . See our lemon odds and nada odds page to see vehicles with no repairs or vehicles with more than three repairs. 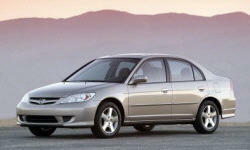 To see how frequently 2005 Honda Civic problems occur, check out our car reliability stats.